If you’ve recently moved into a new house or apartment, you may not have even noticed it didn’t have a doorbell—after all, it’s one of those little things a lot of people forget to check! Today, there are a huge variety of wireless doorbells that you can buy online and install in minutes. These products don’t require any wiring, and they’ll inform you when someone is waiting at your door. When you’re shopping for a wireless doorbell, you’ll want to consider whether it needs to be waterproof, how far the range between the button and the receiver should be, and whether you want camera functionality. If you're not sure where to start, here are the top-rated wireless doorbells that you can choose from. 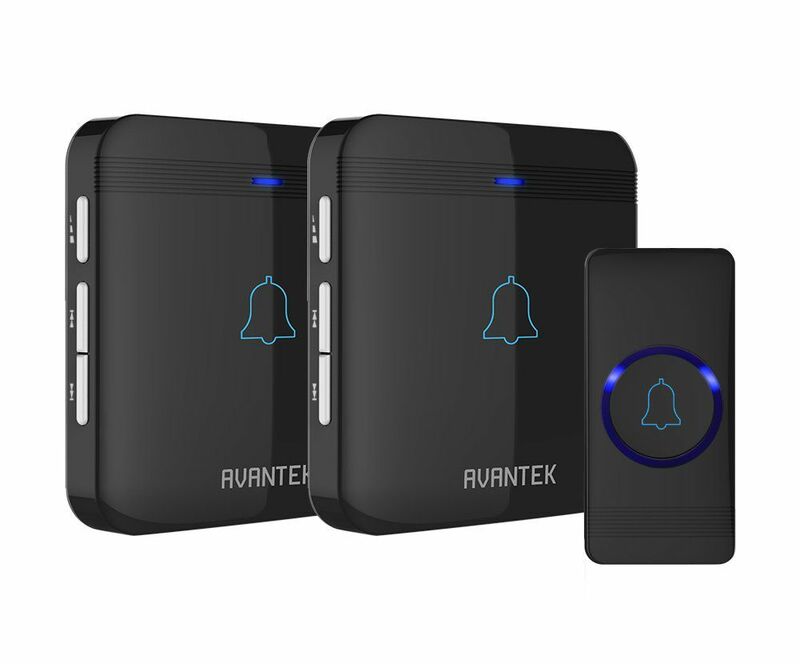 For a highly-rated, affordable wireless doorbell, one of your best options is the AVANTEK D-3B Waterproof Door Chime Kit. This product is easy to install and has a wide variety of options that make it a great wireless doorbell for any home. The AVANTEK Door Chime is waterproof, so you can mount it anywhere outside, and it comes with two plug-in receivers that you can place throughout your home. The receivers have an impressive wireless range of over 1,000 feet, so you can truly put them anywhere. Additionally, there are 52 sounds you can choose from and five adjustable volume levels. Reviewers say this doorbell works wonderfully, and many note that thanks to its long range, they use it in apartment buildings. Additionally, several say the ability to choose your chime sound and volume level is a big plus. Wireless doorbells are typically inexpensive, and one of the most affordable options out there is the SadoTech Model C Wireless Doorbell. While it costs less than $20, this product still boasts more than 6,000 5-star reviews from happy users. The SadoTech Model C Doorbell comes in a whopping 14 colors, and it has an operating range of 500 feet for its plug-in receiver. There are more than 50 chimes to choose from, as well as four volume levels, and the button is waterproof, so you can place it outdoors without worrying. Reviewers say it is easy to set up and work reliably—plus, the low price is unbeatable. If you’re willing to spend a bit more on a wireless doorbell, you can get one that has a camera integrated. Products like the Remo WiFi Wireless Video Doorbell allow you to see who’s at the door via your smartphone. This battery-powered video doorbell sends push notifications to your phone anytime someone rings the bell, allowing you to pull up a 720-pixel video stream on your smartphone. It also features two-way talk capabilities and maintains an activity log of missed rings. The RemoBell is water and weather-resistant, and it can be synced to up to five different phones. Reviewers say this wireless doorbell works as advertised, allowing you to see who’s at the door from your smartphone. However, several say it’s difficult to set up and install, and some people note it records a lot of false motion detection alerts. Smart home technology is rising in popularity lately, and if you want to install a smart wireless doorbell in your home, your best option is definitely the Ring Wi-Fi Enabled Video Doorbell. This smart doorbell includes HD video and motion-activated smartphone alerts, and it gets top marks from thousands of reviewers. The Ring doorbell installs in a matter of minutes, and its camera provides a 720-pixel video stream to your smartphone. You’ll get notifications any time someone rings the bell, and you can also use the Live View features to get on-demand video and audio. The product has two-way talk capabilities, as well as motion-activated alerts. Another perk of this smart doorbell is it works with Amazon’s Alexa, which will alert you when someone rings the bell. Reviewers say this product is cool and provides high-quality video. However, several do complain the doorbell has a lot of false motion alerts based on cars driving by or tree branches. Many older apartment buildings don’t have doorbells for each unit, which can be frustrating if you’re waiting for visitors or a delivery. Luckily, you can get an inexpensive wireless doorbell to alert you of visitors—such as the Lovin Product Waterproof Chime Kit. This doorbell kit includes an adhesive to attach the push button, and it has an impressive range of 1,000 feet. A few reviewers note the product works well for second floor apartments. Additionally, there are 36 ringtones and four volume levels to choose from. Reviewers say it’s easy to install and the range is great. A few note the sound quality isn’t the best, but it still does its job effectively. One of the frustrating aspects of wireless doorbells is that their batteries may need to be replaced regularly. If you’re looking for a product with long battery life, you’ll like the Honeywell Series 9 Wireless Portable Door Bell. This modern product has a sleek design, including an illuminated halo on the button and LED strobe alerts in seven colors on the receiver. Its range is up to 450 feet, and it has eight sounds, adjustable volume, sleep mode, and mute options. Plus, the battery on this wireless doorbell will last up to five years—yup, that’s right! So you won’t need to replace its power source any time soon. Reviewers say the Honeywell Series 9 Doorbell works wonderfully, even transmitting through several walls. Plus, many say they love the cool modern look of the receiver and note you can download additional chime sounds if you want. You can save yourself a little money on batteries with a product like the Hampton Bay Wireless Plug-In Door Bell Kit. This simple, highly-rated wireless doorbell includes a plug-in receiver that doesn’t require any batteries, and its button just needs one battery. This kit comes with a chime and a wireless push button. It keeps things simple with a ding-dong tone, and it can transmit up to 100 feet. The chime plugs into a standard wall socket, and the unit comes synced and ready to install. If you like straightforward, no-frills products, reviewers say this is the new doorbell for you! If you don’t have a porch to provide cover for your doorbell, it’s important you get a product that has a waterproof button. The CROSSPOINT Expandable Wireless Doorbell Alert System will stand up to any weather, and as an added bonus, it comes with multiple receivers and transmitters. This expandable doorbell alert system comes with two buttons and two plug-in chimes with a 500-foot range, and both buttons are 100 percent waterproof. The receivers have 52 tones to choose from, as well as four volumes, and it takes just minutes to set up. Additionally, the company sells additional buttons and receivers, allowing you to expand your setup if needed. Reviewers rave about this product, saying it goes “beyond expectations,” especially for its reasonable price. Many say the range is great and the product is easy to set up. Those with large houses may prefer to have multiple receivers so you can hear someone ring the doorbell, no matter where you are. One of the most cost-effective, popular dual-receiver wireless doorbells is the SadoTech Model CXR. This product comes with one button and two plug-in chimes, making it a great solution for two-story homes. You can choose from 52 different chimes and four volume levels, and it has an operating range of 500 feet. Reviewers say installation is a breeze and the chimes are loud enough you can hear them throughout your home. Our writers spent 2 hours researching the most popular wireless doorbells on the market. Before making their final recommendations, they considered 18 different doorbells overall, screened options from 14 different brands and manufacturers and read over 40 user reviews (both positive and negative). All of this research adds up to recommendations you can trust.